Mason Cash is a very distinguished British brand of mixing bowls, pudding basins and petware. Their traditional mixing bowls and pudding basins are easily recognised across the world, as are their feeding and water bowls for dogs and cats, which they first introduced in the 1930s and 1940s. The bowls shown on this page are still manufactured to this day and have become design classics. Mason Cash has its origins around 1800 in Derbyshire, where potteries were founded to take advantage of the local availability of both clay and coal. Made from cane glazed earthenware, our Mason Cash Cat Bowls reflect the original colour of the clay used by Mason Cash in Derbyshire. The special glazed finish on the outside makes these bowls stain free. 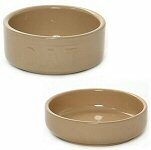 What we also like about these Cat Bowls is not only their classic design (the feeding bowls is lettered), but also their weight - unlike lightweight plastic bowls, these ones stay put, even when being used by the most enthusiastic of pets.